Imaging agents are also being developed as part of the NExT program. The growing interest in these agents stems from their potential to diagnose, stage, manage, monitor, and even treat tumors. One such agent under development is 111Indium-trastuzumab. Trastuzumab targets the human epidermal growth factor receptor 2 (HER2), which is overexpressed in breast and other cancers. 111Indium-trastuzumab imaging, if successful, could be used to localize HER2-positive disease in patients with metastases. It could also identify HER2-positive lymph nodes, and therefore may be useful in conjunction with sentinel node biopsy. The imaging agent may also provide a measurement of HER2 expression within tumors that are inaccessible to biopsy. Moreover, because the process in which the 111Indium-trastuzumab is made allows other radioisotopes to be substituted for 111Indium, a variety of radiolabeled trastuzumab agents could be made for delivering localized radioimmunotherapy to HER2-positive tumors. A phase 0 trial using 111Indium-trastuzumab scanned its first patient in Spring 2008. 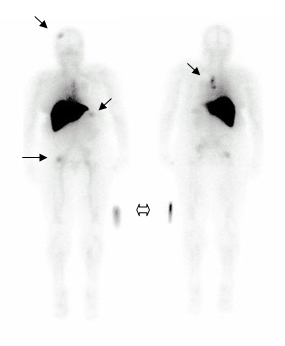 Whole body images of a patient with HER2-positive metastatic breast cancer 4 hours following injection of 111Indium-trastuzumab. The solid arrows demonstrate uptake in bony metastases. Intense uptake in the liver is physiologic because it is the primary route of excretion. The hollow arrow indicates the location of a radiation source placed external to the patient for calibration.